This is the next best thing to having an actual instructor standing beside you. With this book, you'll find out that author Tom Wolsky really knows his stuff. This is a hands-on practical book filled with step-by-step tutorials to follow along. The instructions are clear, and there are many good tips and shortcuts provided. Coverage is comprehensive. The tutorial files, the sample videos to work on, are available for download on the book's companion website. The thing to note is the tutorial files are created for FCPX version 10.9 and older. However, the author has also updated the tutorials files for 10.1 and newer versions, which is great. Don't download the wrong versions because the files are quite big. The book title gives the impression that this book is something to help you transition from iMovie or Final Cut Express. Well, that's not the case. It is great for beginners with absolutely no prior experience in video editing because it assumes the user has no prior knowledge. It does slips in some tips for users who are transitioning from other software though. 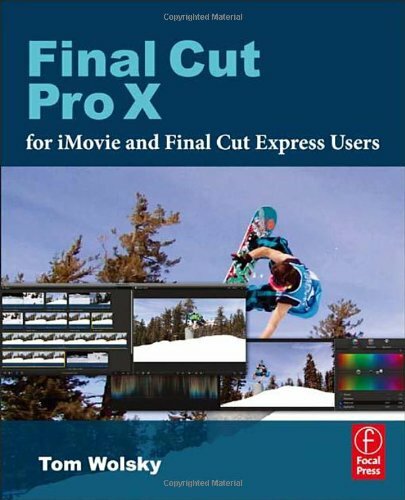 If you want a book that shows you the ins and outs of Final Cut Pro X, this is an excellent choice.